It offers what most people want: fast work with small files and copies, and a budget-friendly price. WD’s My Passport 4TB mobile USB 3.0 drive lets you stuff a lot of data in your pocket without emptying it of cash. While not as fast with sequential transfers as the LaCie and Seagate drives we’ll be comparing it to, it’s certainly fast enough. And, at $115 on the street, it's considerably cheaper. 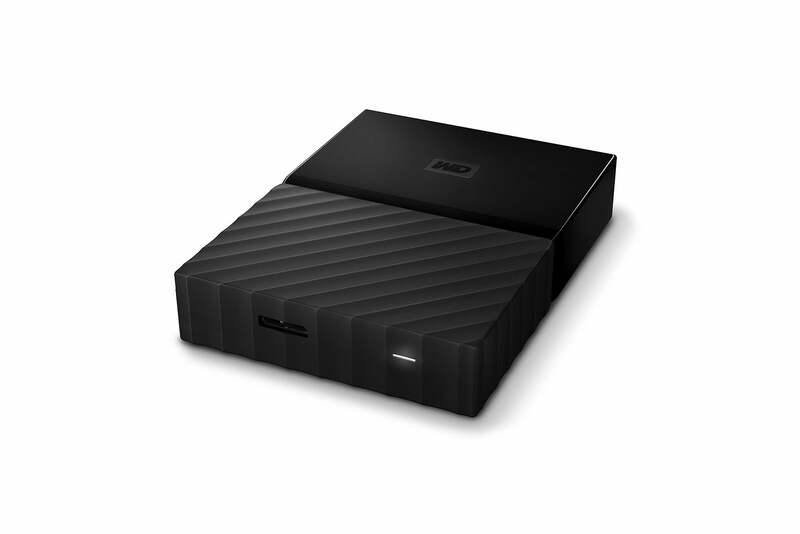 Because the 4TB drive housed inside is 15mm thick, the My Passport 4TB isn’t as thin as many lower-capacity units, measuring 0.85 inch from top to bottom. It’s approximately 4.25 inches long, 3.1 inches wide, and weighs around 8 ounces. The My Passport is also available in $60 1TB, $80 2TB, and $100 3TB capacities, with the 1TB version being about 0.2 inch thinner and 2 ounces lighter. All models come with a three-year warranty. The My Passport also ships in a variety of hues, starting with the black of our test drive and moving on to brighter white, red, orange, blue, and yellow. That’s six in all: one for every weekday, plus another for the weekend. Lest you consider that remark flippant, note that some backups are rotated by days of the week, and a little color-coding never hurt anyone. WD informed us that the colors are simply to entice buyers, however. The WD My Passport offers more flair than you might expect from a mainstream portable USB drive. The wavy bevels also make for a better grip. WD has added even more consumer bait by beveling a stylish wavy texture into the half of the drive that’s home to the powered micro-B USB port and power indicator. The waves also provide a better grip on the smooth, glossy plastic. After the color-coding response, we didn’t ask whether tactile grip was the reason, but it does have that effect. WD doesn’t provide anything fancy like LaCie’s dual FAT/NTFS or HFS+ partitioning utility, but you can use the Windows or OS X (or Linux) system utilities for that. 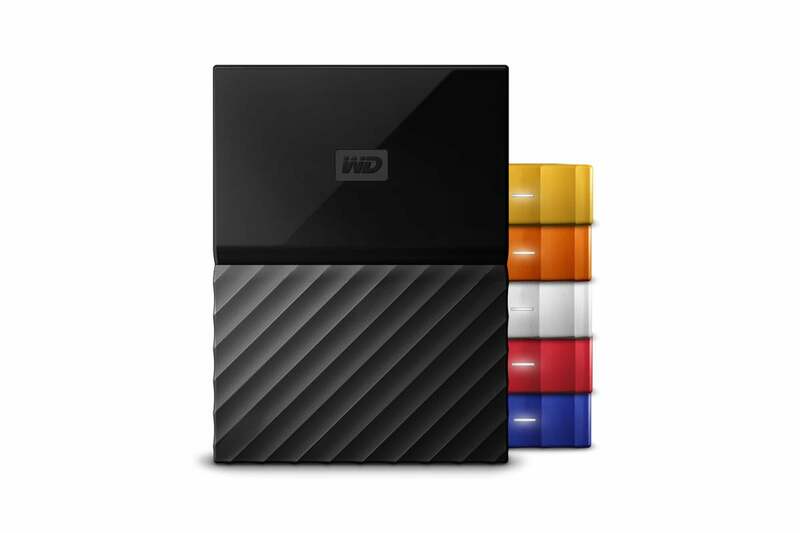 WD does provide backup software; a drive utility that will check the status and secure-erase the drive; as well as encryption software for dealing with sensitive data. This is a very nice software bundle considering that the My Passport is essentially the company’s entry-level USB drive. We started off the review with a mild warning about the My Passport 4TB’s tepid performance with large files, and indeed it falls about 10MBps short of average. But it’s also better than average at writing large batches of smaller files and folders, as you can see in the chart below. 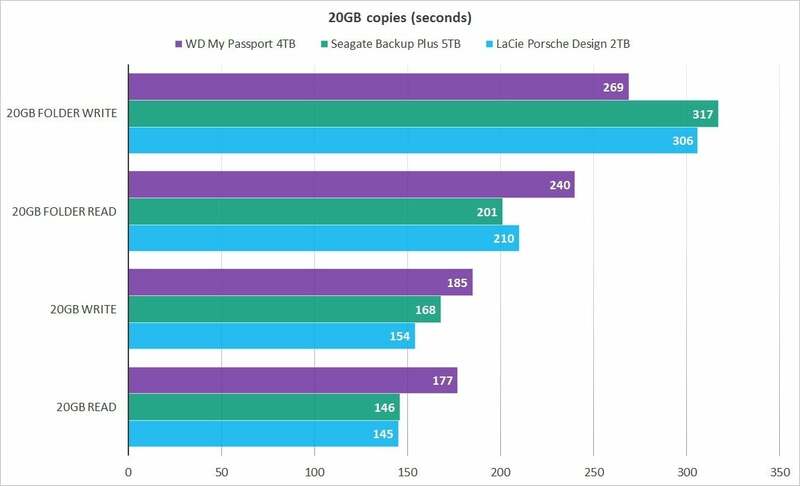 The WD My Passport is faster than its Seagate and LaCie rivals with lots of smaller files and folders, but not in sustained throughput. 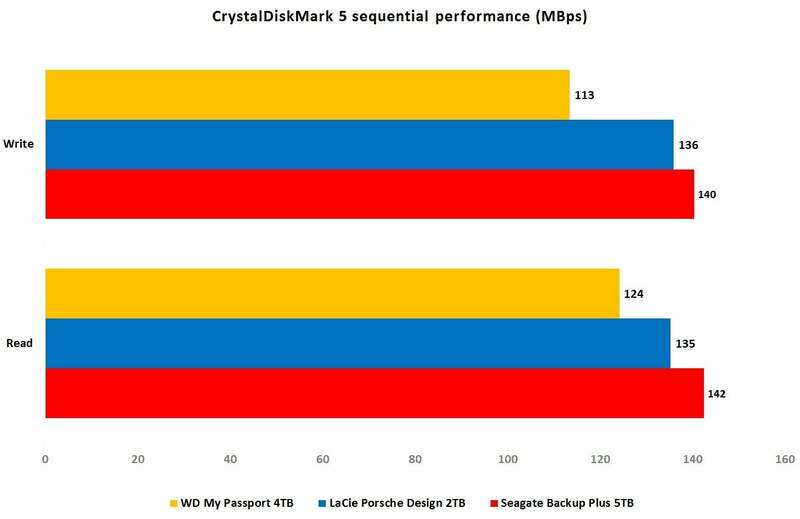 Still, CrystalDiskMark shows a clear drop-off from Seagate’s products (the company owns LaCie) when it comes to sequential throughput. CrystalDiskMark rated the WD My Passport as slower than LaCie and Seagate’s similar drives, but it’s still fast enough for most purposes—and cheaper. Okay, the WD My Passport isn’t the Seagate Backup Plus Fast, or the Samsung T3, which are what you want if you need to copy a fair amount of stuff quickly and be on your way. But it offers what most people want: fast performance with small files and copies, and a budget-friendly price—at least currently. If you're paying MSRP (about $5 to $20 more), it’s a somewhat trickier decision whether to give up the 10MBps to 20MBps of sustained throughput offered by other drives. Lots of storage for less than the competition, attractive styling, and good performance with small files highlight this USB 3.0 portable hard drive. An excellent bargain.